Behind the Scenes: Bershka Collection SS15 #GETWILD | StyleAble Fashion For Everyone! The three lines displayed were Bershka, BSK and Man, with something vibrant interlinking the three – 1970’s Marrakech. 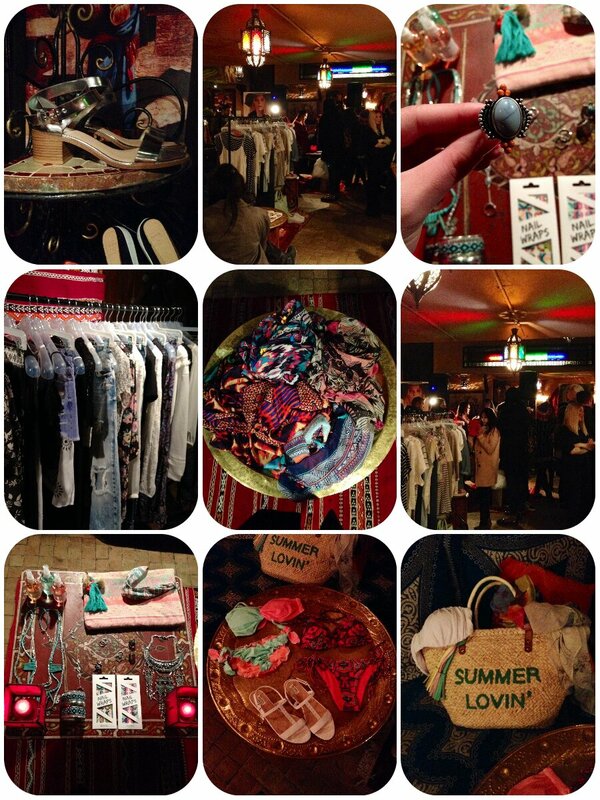 Souk Medina was the ideal location for the showcase, with its North African interior and intimate ambience. 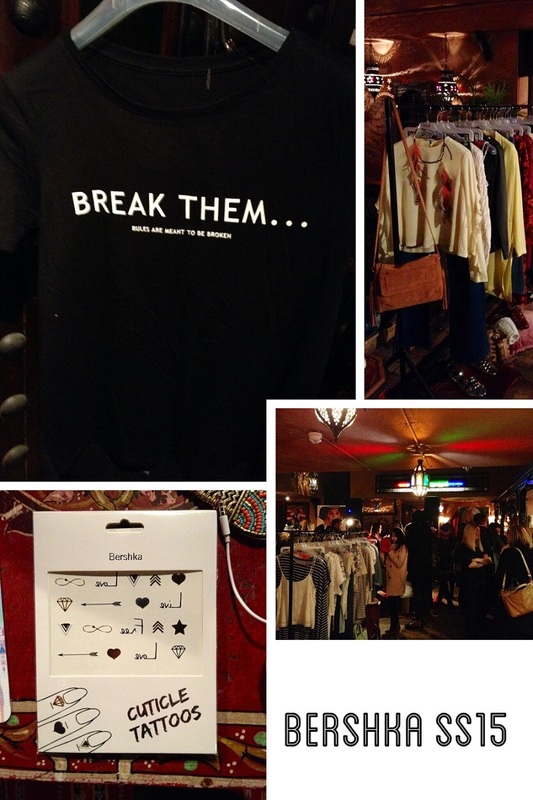 The event and brand exuded the feeling of having fun, feeling free and exploring you. Morocco was the desired location for this season because they were “inspired by the musicians, designers and artisits who passed through in the 70’s”, a trend that is bang on for this summer! Let’s start with the women’s line #BERSHKA. The designs are heavily inspired by the Seventies, with a merge of alternative influences creating something for the eye. The natural earthy tones of papaya, tan, ecru and yellow are ethnic and tropical, giving it a “gypsy chic” bohemian feel that is so key for this summer. Crochet detailed tops, fringed jackets, suede-esque skirts, flared denim and guipure lace dominated the scene. The faux suede, tan, fringed jacket stole my heart with it’s details and soft touch – very Nashville meets Morocco! There were fresher tones and lighter fabrics also swarming the rails with blue, white and black being symbolic. Sheer lace kaftans, palazzo trousers and cool sweatshirts were making a stand, giving the clothes a “New Romance” vibe – both floaty and fun. Next, #BSK – Bershka’s teen collection. This took inspiration from Seventies and Nineties beachy California and Australia’s Byron Bay. It’s a blend of casual, preppy, bohemian and romantic, which is experimental and exciting, just like a teen. There were kimonos, stripy and logo t-shirts, lace vest tops, distressed denim, floral print and lace shorts, crochet, tulle embroidery, the list goes on and on. The fresh, natural summer tones of yellow, turquoise and coral is a colour palette that rocks and will make a real statement this coming season. And then we have #MAN. The inlfuence is very urban meets preppy, with designs for the casual comfortable guy versus the daring style concious man. Aztec print t-shirts, geometric motifs and destroyed denim met trendy bomber jackets, chinos and micro-print shirts.There were camel, coral and green tones contrasting to the classic colour scheme of black, white and an array of blues – something to suit every summer mood. For those into their fitness, there were some functional designs that will appeal to the style savvy ladies out there. Lot’s of bold Aztec prints and shades of coral teamed with grey, white and black basics. You can look good and feel comfortable while you’re working up a sweat and perfecting your summer body. Handbags, shoes, rings, necklaces, bangles, cuticle tattoos, nail wraps, body mists, phone accessories – there were so many little knick knacks that will get us all pumped for the summer.